Rainbow of Magnolia Fountains of Life & Nikos Gyros invite to a fundraising brunch supporting the Foundation orphanage in Kenya. The program includes a slide show about Foundation activities in Africa. 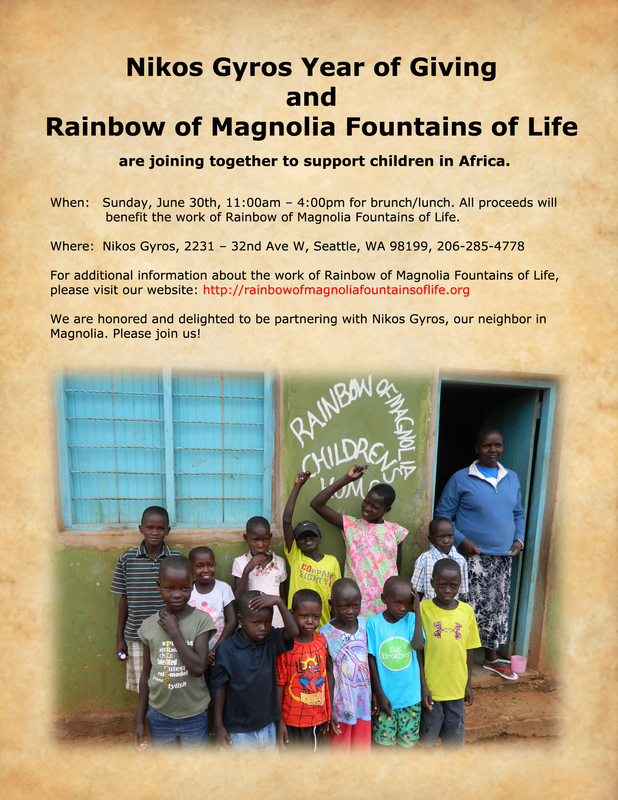 Rainbow of Magnolia has been building wells, schools and orphanages in East Africa for several years. In this fundraiser it partners with its Magnolia neighbor, Nikos Gyros. Where: at Nikos Gyros restaurant, 2231 32nd Ave W, Seattle, WA 98199, 206-285-4778. Polish Home Assn presents an evening with Magdalena Zawadzka in the program Piosenka jest dobra na wszystko that includes songs from the Kabaret Starszych Panow by the author-composer duo Przybora & Wassowski, with piano accompaniment by Piotr Salaber. Ms. Zawadzka is a famous stage, film and TV actress. Mr. Salaber is a composer and pianist. This program is in Polish. Where: at the Polish Cultural Center Dom Polski; tickets $35 regular, in Polish. For tickets call Lucy 206-764-7057, Renata 206-363-7917 or Ania 425-876-1568. The book for the meeting is Miedzianka. Historia znikania by Filip Springer, published by Wyd. Czarne in 2011. Miedzianka is a very well written and moving story of a copper mountain and the town of the same name in Silesia that vanished after 700 years. Springer is a reporter and photographer publishing in the Polish weekly Polityka. His book was nominated to the 2011 Kapuscinski award and the 2012 Nike award. Club meetings are in Polish. The Polish Parish of St. Margaret in Seattle invites everybody to a yearly Parish Festival running from 11 am till 5 pm with additional dancing at 7 pm. Attractions include performances by the Young Polanie dance group and other music groups, games and entertainment for children and teens including singing, dancing and recitation competitions. Also available favorite Polish dishes, home made desserts and Polish beer. Where: St. Margaret’s Catholic Church in Seattle; from 11 am to 5 pm, admission free. More: Please contact Iwona Bernacki at 425-802-7136 for more info, or Ada Bazant at 360-568-5483 about entering competitions for children and teens. Seattle Public Libraries present piano concert Chopin's Greatest Hits by local Polish pianist Marzena Lillian Szlaga. The program opens with Grande Valse brillante and includes mazurkas, nocturnes, Fantaisie-Impromptu, waltzes and polonaises by Frederic Chopin. Ms. Szlaga is a pianist and the founder of Lillian Szlaga Piano Studio in Kirkland. The Portland State University Symphonic Orchestra and Agnieszka Laska Dancers present Igor Stravinsky's masterpiece The Rite of Spring, celebrating 100 years anniversary of its premiere, with Ken Selden, conductor and Agnieszka Laska, choreographer. Where: at Lincoln Performance Hall, Portland State University, Portland, OR; tickets & more info.